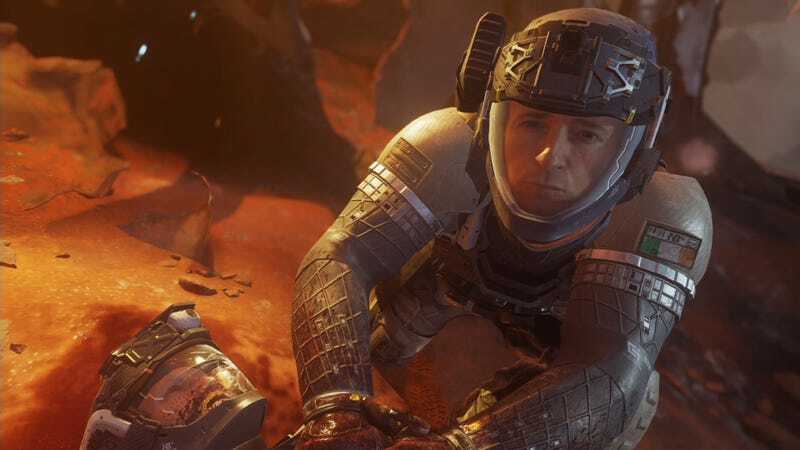 Call of Duty: Advanced Warfare’s “Press X To Pay Respects” is a infamous example of the series use of button prompts as a narrative device. Infinite Warfare has a couple as well, including this scene, in which a character’s life fades away as you hold the shoulder buttons. Late in Infinite Warfare’s campaign mode, protagonist Captain Reyes crash-lands his fighter on Mars. As he stumbles about, disoriented, the battleship he and his crew have been using as a base also falls, leaving pain and destruction in its wake. Reyes slowly makes his way towards the crash site, witnessing the horrors of space war as he approaches. A wounded soldier cries in pain. Another crawls towards a med kit, only to die with it just out of reach. Then Reyes comes across a Marine Sergeant pinned beneath some rubble. Reyes helps lift the debris from the wounded man, only to discover that a jagged piece of metal has pierced his chest, and he’s in danger of bleeding out. While another soldier runs off to look for a medical kit, Reyes must apply pressure to staunch the blood flow. As any medical professional will tell you, this is done by holding L2 and R2 on the PlayStation 4 controller. Unfortunately the player’s efforts are all for naught. The controller vibration simulating the Sergeant’s heartbeat (really) slows and stops. He passes with your virtual hands still pressed hard against his chest. It’s supposed to be a dramatic moment, but it’s borderline silly. If you choose not to hold down L2 and R2, the scene plays out exactly the same, only you don’t feel the heartbeat with your controller. So what’s the point? I don’t know, man. I guess this character’s passing is supposed to carry some weight, and it probably would had the character this one replaced hadn’t himself died a few chapters back. Whatever. Rest in peace, guy whose name I can’t remember. You didn’t die in vain, I guess.